For low-volume sublimation, the 24" wide SubliPro is the oven for you! For a production of around 150 mugs per hour, the HIX SubliPro Oven is the perfect choice. As the only one of its kind in the industry, this oven can sublimate on a variety of substrates: wide, tall, short, white, coloured, or black, up to a height of 8.5". This includes an ever growing variety of sizes and shapes such as cat and dog bowls, shot glasses, beer steins, latte mugs, glasses, drinking bottles, etc. 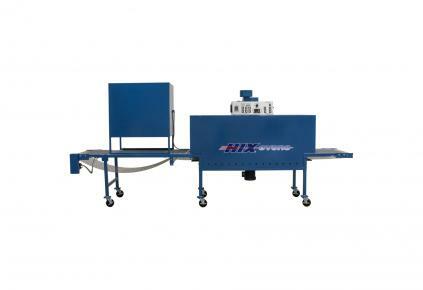 With redesigned and repositioned heaters combined with an advanced airflow circulation, HIX was able to narrow the temperature variation within the oven chamber to within 10-15F, which is sufficient to satisfy even the most demanding and unforgiving substrates (such as black mugs and top-to-bottom sublimation). The even temperature profile, the larger door opening, the advanced cooling system at the exit end of the conveyer, and the stainless steel belt all represent a significant upgrade over our previous mug oven design. Full product specification is available in the help section of our website.